Why did I receive an error when trying to file with ECF? Connecting with the different court sites involves many factors and because of this, there are many reasons that a filing could fail with the court. If you received an error that your ECF credentials are incorrect, please confirm that your credentials are correct in your settings page. A good way to confirm they are correct is to try to login to your court's bankruptcy ECF site with those same credentials. If you receive an error message from the court that your credentials are incorrect, please contact the court to reset your credentials. Also, make sure you are providing the credentials for your court's Bankruptcy ECF login and not the District ECF login. The link for each court's site can be found on our Resources page. If you receive a general error, please refresh your page and try filing again. You will need to enter the SSN and select the Divisional Court to try to file again. The filing process can be long and sometimes the connection with the court's site can be disrupted which can stop the filing. Sometimes refreshing and trying the filing again resolves the issue. If you've tried again and still receive the error, please contact NextChapter so that we can review to see what caused the error. You can either send us a message with the case name and request via email - support@nextchapterbk.com or you can send us a message through our in-app chat service. We will review your message and the case filing error and we will get back to you within 24 hours. If the filing is urgent, you can download the packet to save and upload to the court's site manually. 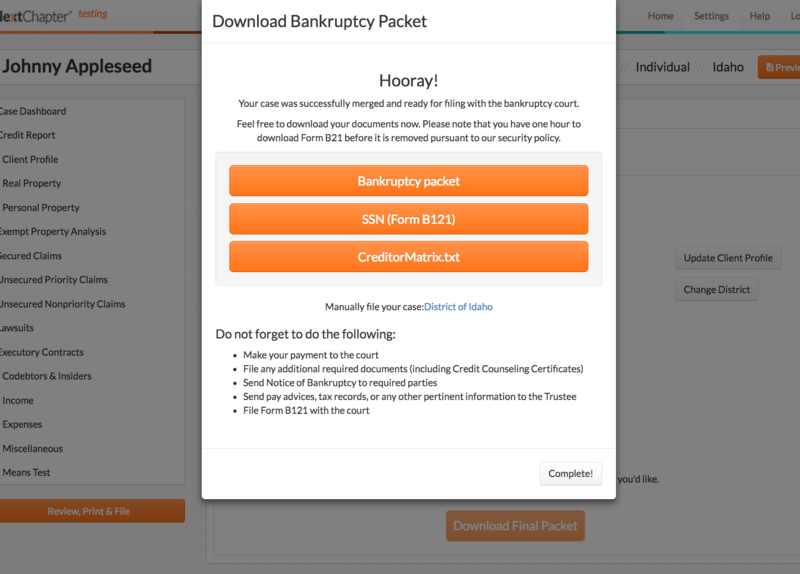 When you download the packet, you will also be provided with the creditor matrix text file that is required by most courts and it can also be saved and uploaded to the court's site.